Before leaving the U.S., we’d started to get into hiking. With the beautiful natural areas in Oregon, it’s not hard to find a hiking trail to fit your mood. 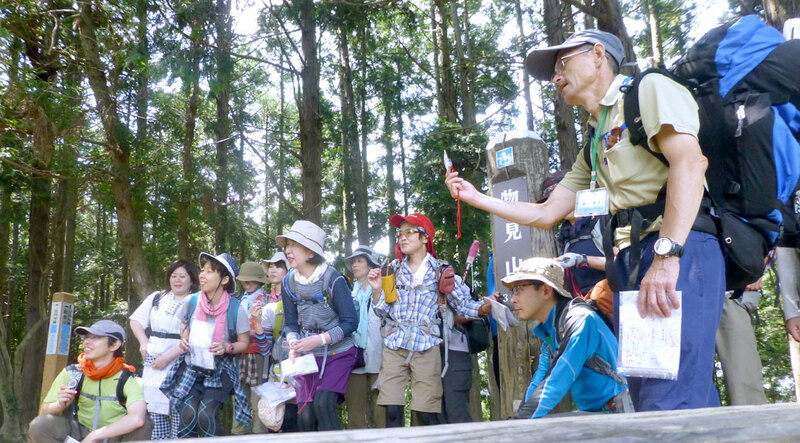 Japan offers many hiking opportunities, but our area is so citified that greenspace is mostly limited to parks with walking paths. 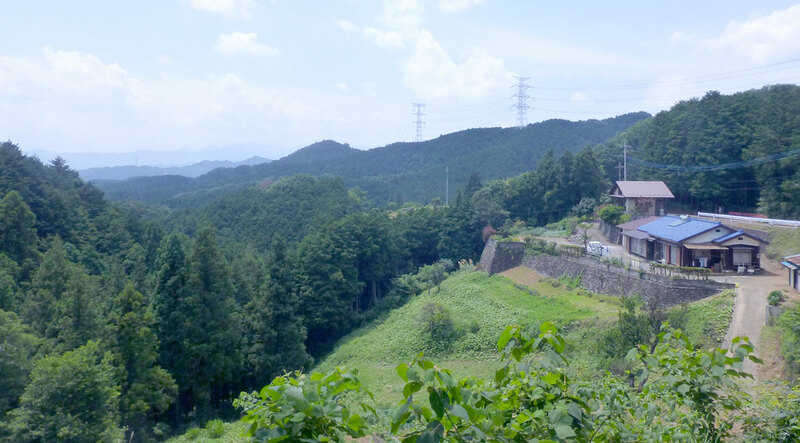 However, just a short train ride to the west lies the Okuchichibu Mountainous Region (奥秩父山地). The area is full of wooded hiking trails and reminiscent of the Cascade and Coast ranges back home. Hidaka City is the gateway to the Okuchichibu region, with three great peaks and just a 15 minute train ride from our station. We headed for Hidaka, choosing to brave the 90-plus degree temperatures following a few days of Typhoon Neoguri leftovers. Luckily, although just a few miles west, the temperatures were pleasant and a light breeze made for a comfortable day. We’d been to Hidaka recently for lunch, so we knew that we needed to plan slightly better for the bus ride. 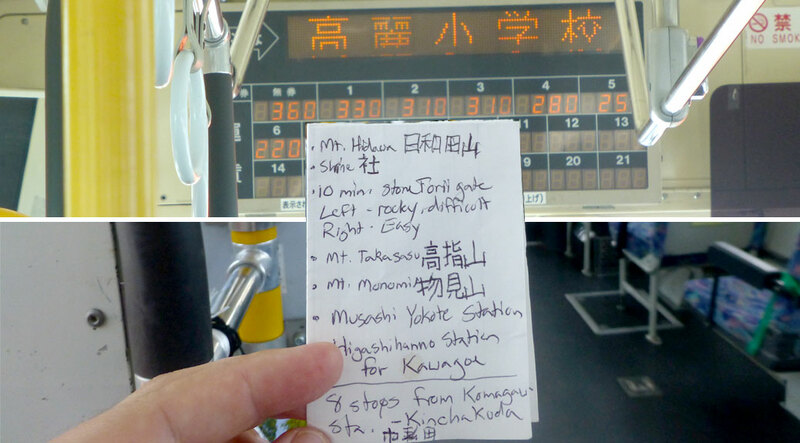 In reading the few reviews I could find for the hike, I also knew we wouldn’t see much rōmaji, so I carefully wrote out the kanji for each mountain we’d be hiking and the bus stop we’d need. Since the bus only stops when people need to get on or off, we played some Bus Stop Bingo trying to match my scribbles to the reader board on the bus. 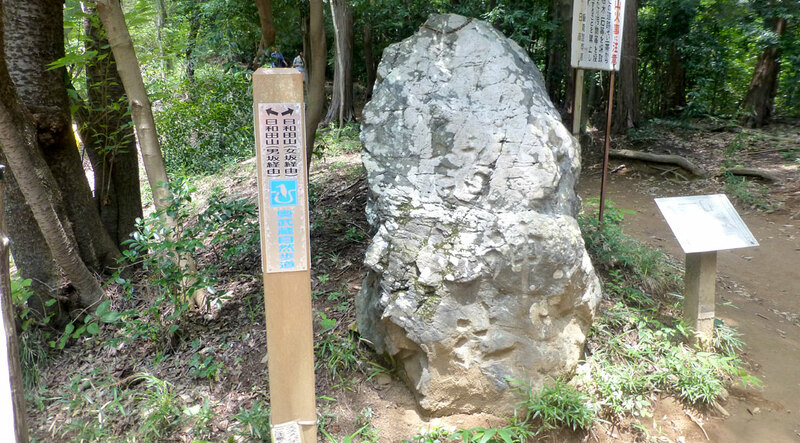 The sign from the road pointing to the Hiwadayama trail head. After successfully departing the bus at Kinchakuda, we headed up the road to the Mt. Hiwada (日和田山) trail head. The trail had a couple options. You could walk the gentle slope of the switchbacks up to the start of the main trail or follow the makeshift stairs straight up the side of the mountain. 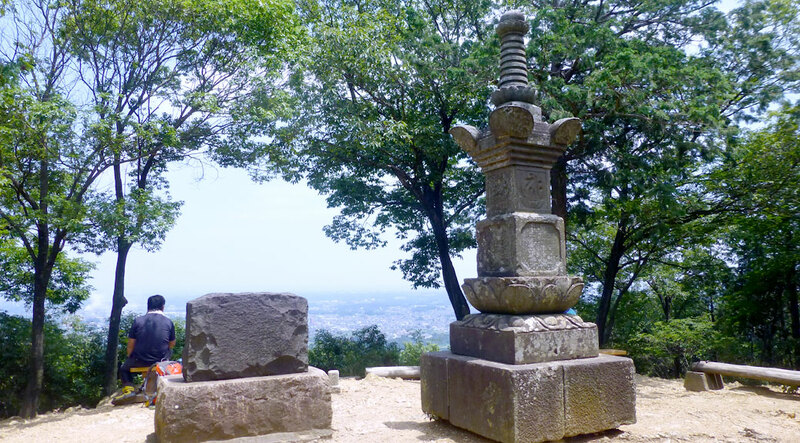 We opted for the challenge of the stairs and worked our way up to the trail’s first torii. 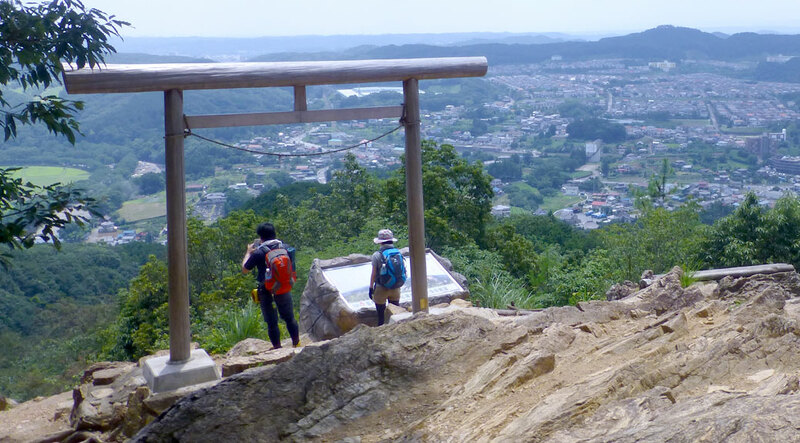 At the top of the initial climb, the trail splits into two paths to Hiwada’s summit. 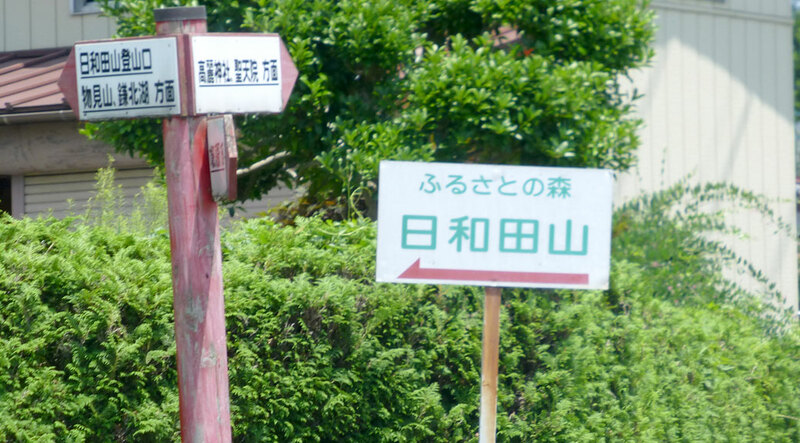 The politically-incorrect options: to the left, the “Men’s Course” (男坂経由) and to the right, the “Women’s Course” (女坂経由). In true Cascadian fashion, we opted for the more difficult Men’s Course, a rocky and hilly climb to the peak. 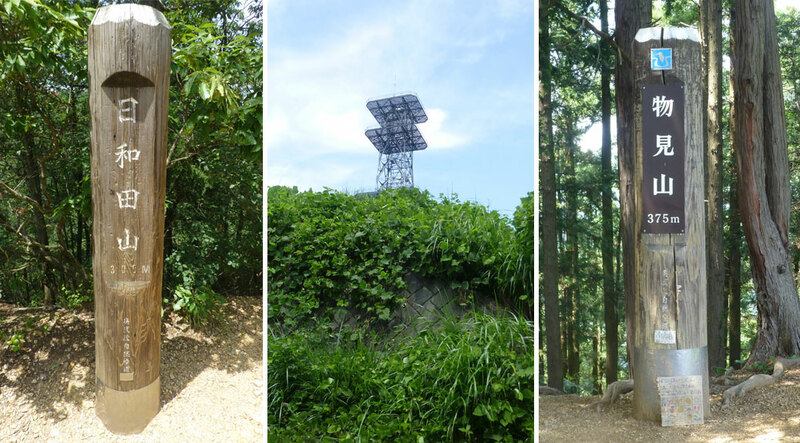 The trees opened up along the way to offer views of Tokyo to the east and the Okuchichibu region to the west. Eventually, the summit comes into view as a large torii frames Kotahira Shrine. From the shrine, it’s a short, rocky climb to the peak. From the trail head to the summit, it was about 1,000 ft of elevation gain over a half-mile distance. The straight-up climb plugged our ears, but the benches at the summit offered a chance to adjust to the elevation. From here, it was about a one-third mile walk to the Mt. Takasasu (高指山) summit. The short path felt like exploring the jungle in Lost. Oddly-placed, dilapidated structures rose from the trees around every corner. The summit itself was marked by a radio tower surrounded by a rusted, broken-down building. We quickly moved on before the Smoke Monster decided to make an appearance. The summit of Mt. 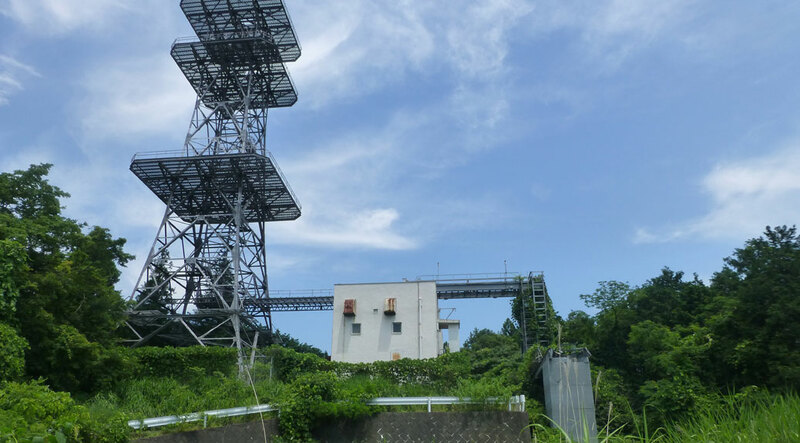 Takasasu, otherwise known as Dharma Initiative Station 11, The Tower. 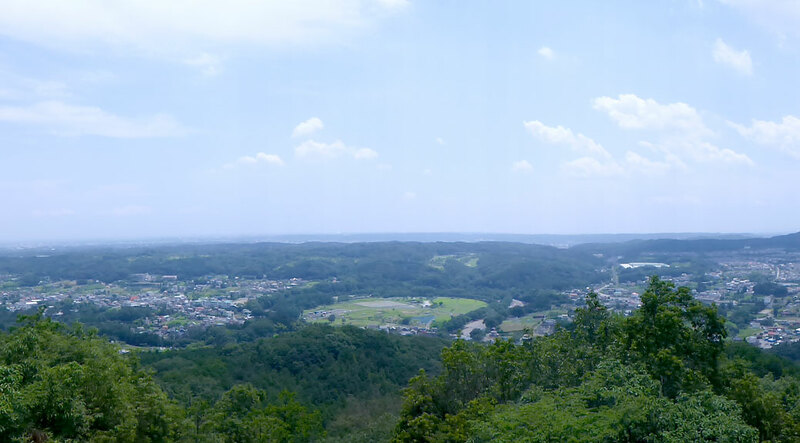 The last peak was Mt. Monomi (物見山). Along the way, a beautiful view emerged with a house perched over a valley with views of nothing but trees and mountains. A small rest house offered respite from the sun as well as vending machines and restrooms. We stopped briefly to refill the water bottle and buy a couple sports drinks before moving on. The Monomi trail was some of the day’s more challenging terrain. The recent rain left some muddy spots and steep, rocky trails interrupted the smoother paths up to the summit. At the top, any potential view was blocked by pesky trees, but some comfy benches allowed for another short rest and a snack. A large hiking group came in from another trail and stopped to take a picture. In a funny moment of cross-culturalism, the photographer urges the group to “Say Chīzu!” While the shape of the word “cheese” naturally creates a smile, the Japanese equivalent of “chīzu” creates more of a, um, dumb face! After saying “chīzu,” they adjust their mouths into smiles and the photo is snapped. We briefly followed the group down the hill, but took the first opportunity to pass the slow-moving herd (on the muddiest part of the trail, of course) to head back down Monomi. The path down winds through some interesting terrain. At times, the path is rocky and muddy, while in other places, you find yourself walking through someone’s orange orchard. Eventually you reach a road and follow it down for about a mile where you end up at Musashi Yokote Station (武蔵横手駅). By the end of the day, we’d hiked roughly five miles and ascended/descended 1,200 feet over three-plus hours. The hike itself was very convenient with well-placed facilities that don’t interrupt the natural experience. The views were unbelievable in places and the trails were challenging, but doable with any level of fitness. I’m sure we’ll venture further into the Okuchichibu region for our next hike, but with the proximity and access of the Hiwada-Takasasu-Monomi trail, we’ll be back here sooner rather than later.